Epic: extending beyond the usual or ordinary especially in size or scope. Too often the adjective “epic” is applied to movies that have no business carrying that moniker. A sad byproduct of that misuse of the word is that when a movie that really deserves it comes along, the word means nothing to the ear and mind. Christopher Nolan has delivered just such a movie to the world. Cooper is a former NASA test pilot that now lives in the American heartland with his aging father, Donald, and two children, Murphy and Tom. Cooper spends his days working not as a brilliant engineer or pilot, but toiling in the hopeless task of tending his corn fields. Cooper is in the position of farmer because the world has crossed over the threshold of disaster. The planet is in the grip of a famine that is responsible for killing the vast majority of the world’s population, either by starvation or war over resources. A blight is causing crop failures all over the world. Massive dust storms ravage the heartland destroying valuable farmland and covering everything in their path with a heavy layer of lifeless dirt. The planet Earth is facing a future where human beings will not be the dominate form of life on the planet. If the human species is to survive, finding a new home is going to be imperative. Interstellar is the epic story of how Cooper and his family shape the course that the human race has to follow for survival. As a writer, Christopher Nolan has brought some truly amazing work to the big screen. Since Memento debuted on the big screen in 2000 he has established himself as one the best Hollywood has to offer. With Man of Steel, Inception, The Prestige and his biggest success The Dark Knight trilogy making up his resume, Nolan has taken on a story, in Interstellar, that is far and away his most ambitious endeavor. 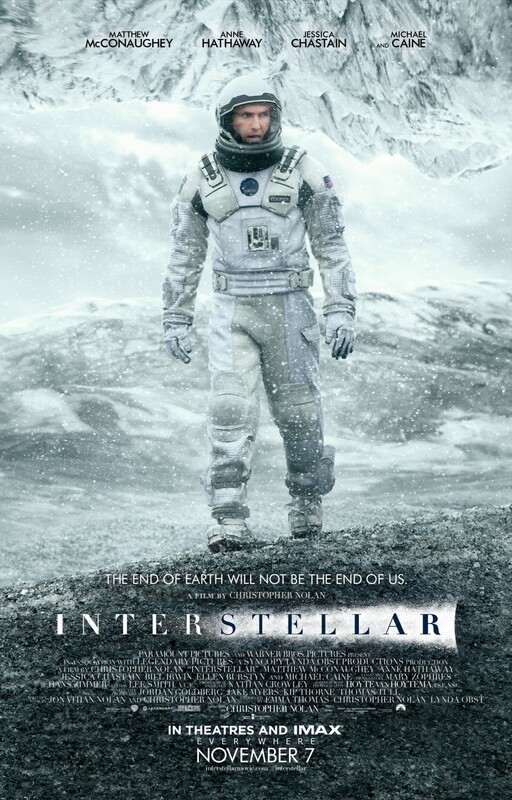 Interstellar is a film that truly deserves the use of the word epic. The first thing that really captured my attention with the movie were the visuals. Maybe it was the fact that I was watching the movie in IMAX, but the scenery and overall scale of everything was close to breathtaking at times. The scenes of the dust storms, the depictions of flight through our galaxy, and the visits to the other worlds were all incredible to the eye. The filming locations were all ideal for the story and the special effects were all perfectly suited to the level of this film. In all, no expense appeared to be spared in making everything “look” perfect. As stunning as the visuals were, the movie did not rely solely on the eye to keep the viewers engaged. The incredible cast that was brought in was able to really bring this massive story to life. To run down the list of well-known talent in this movie is an exercise in, “how many big name actors can we squeeze into one movie.” Matthew McConaughey, Anne Hathaway, Jessica Chastain, John Lithgow, Michael Cain, Matt Damon, Ellen Burnstyn, Topher Grace, Casey Affleck, and MacKenzie Foy make up the majority of a cast that all impressed regardless of the amount of screen time each had. The best performance of the movie has to go to Matthew McConaughey who continues his recent string of impressive performances that include his roles in The Wolf of Wall Street and The Dallas Buyers Club. McConaughey plays the lead role of Cooper, a dedicated family man, farmer, and former NASA talent. Cooper is completely miserable in his existence in a world that sees technology and exploration as wastes of time and resources. The performance of McConaughey as Cooper is one that will only add more weight to his already impressive list of accolades. If the actors and the visuals are the main positives, the size of the story will be the closest thing I can think of to a negative. The story as a whole is incredibly complex and challenging in size and scope. The movie could have been effectively made by focusing on the characters or the story, maybe even as two movies; Nolan did both in one. The main cast of actors all received a fair amount of development to anchor them into the sprawling story. With the story itself, there was no detail left to assumption. It is very clear that Nolan was not going to cut any corners with this movie and the result is a run time that clocks in at over 3 hours. Again, my only negative.